The Export Policies page allows you to assign a client access policy to each of the exports from a core filer. To learn more about how Avere OS uses export policies to manage client access in the cluster, read Controlling Access to Core Filer Exports. Navigate to Export Policies page. Make sure that the correct vserver is selected (use the drop-down selector in the left menu to change vservers if necessary). Select the core filer for which you want to configure access. The page is populated with the exports available on that core filer. If applicable, click the Qtrees checkbox. FXT qtrees permit the Cache Utilization Control feature to limit modified data within top level directories of a root export, so that client rename and hard link operations across FXT qtree boundaries are not permitted. Note that the properties of FXT qtrees are not the same as those of NetApp qtrees. Read Cache Policy Settings - Advanced Options for more information about configuring the Cache Utilization Control. Click Submit to apply all of the changes made in this list, or click Reset to restore the original export settings. If your vserver includes multiple exports that use identical access rules, consider customizing the default export policy, which automatically is applied to all exports. This approach can be more efficient than creating a custom policy and applying it to each export individually. After an export is defined to the Avere cluster, the cluster assumes it will be continuously available and attempts to reconnect with it if contact is lost. If you want to unmount a back-end storage volume, be sure to follow this procedure to avoid possible delays on the Avere cluster. 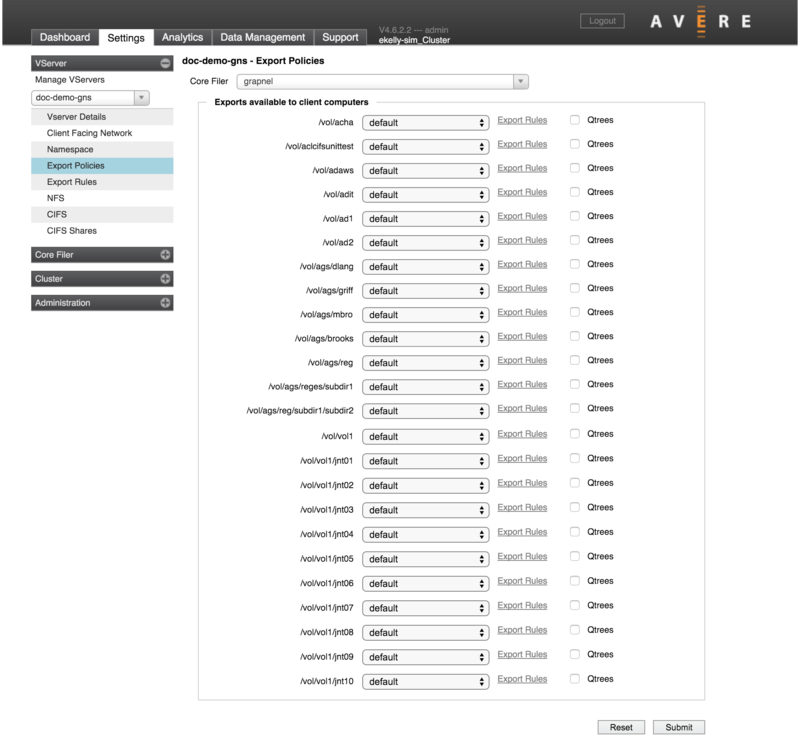 Removing a core filer export from the back-end storage system can cause excessive latency on the Avere cluster if you unmount the export before marking it as offline. Before unmounting any exports on your core filer, make sure that no client access to those exports is being routed through the FXT Series cluster, even if you plan to unmount and remount the clients. Follow the procedure for unmounting exports as described in your core filer documentation. The -u parameter on the exportfs command unexports the specified volume without changing the Data ONTAP system’s/etc/exportsfile. Check the list on the Export Policies page to ensure that the export no longer appears in the list.